Beyoncé and Jay-Z onstage at Gillette Stadium on Sunday. Foxborough — For the past three years, Beyoncé Knowles and Shawn “Jay-Z” Carter have been playing out their own version of a real-time domestic drama, using pop culture’s increasingly panoptic view of stardom, their individual and collective megastardom, and their wide-ranging musical talent to chronicle the downs and ups of their relationship. The musician-slash-moguls married in April 2008, and started dating around the turn of the century — unofficially, an eon in celebrity years — but embraced and were able to sustain an Old Hollywood mystique around their relationship, a huge anomaly for the TMZ era. Until 2016. That April, Beyoncé released “Lemonade,” a gripping, genre-melding “visual album” that hinged conceptually on infidelity and its attendant stages of grief, and captivated music critics and gossip hounds alike. A little over a year later, Jay-Z released “4:44,” a brief yet potent album that focused squarely on his inner life, including his apologies and grieving over the charges leveled against him on his wife’s earlier broadside. Jay-Z and Beyoncé perform at Gillette Stadium. 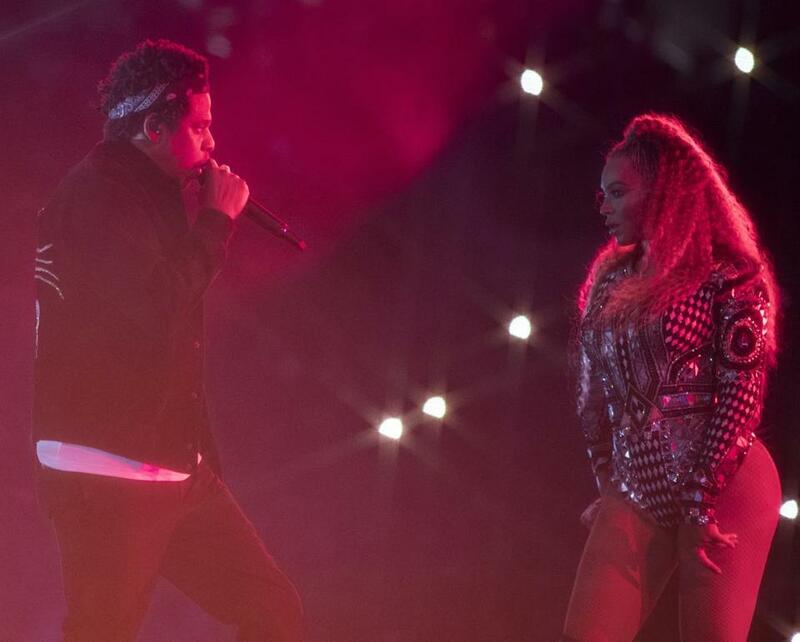 In March, the duo announced a sequel to the On the Run tour, which began in Cardiff, Wales, and arrived at Gillette Stadium Sunday, suggesting if not a reconciliation at least a détente; at the end of their London show on June 16, the video screens flashed “ALBUM OUT NOW” to signal the release of the trilogy’s final section, the celebratory yet frank “Everything Is Love.” On the Run II, now with the added bonus of songs from that last chapter, traces its romantic arc through both artists’ smash-stuffed catalogs, collaging lyrics so that they’re in conversation with one another, rearranging songs so that they reverberate — sonically and emotionally — throughout the stadiums this tour is playing. From time to time, films that corresponded to each segment’s theme (directed by Melina Metzoukas) would overtake the massive video screens; shot in Jamaica, they at times had the grainy, lived-in feel of home movies, and got meta when Beyoncé (on the beach) and Jay (in the bedroom) picked up the cameras themselves. A clip that included a tense scene at a bar and gorgeous yet shocking shots of a house being torched to the foundations presaged the show’s dramatic turn — but those flames were no match for the righteous fury Beyoncé showed on “Ring the Alarm,” which had its backing track amped up to a stadium-worthy stomp, and “Don’t Hurt Yourself,” which had her storming the stage while fire-and-brimstone pyrotechnics broiled the already-hot crowd. Once the dust cleared, though, both Beyoncé and Jay went into reflective mode; Beyoncé showed off her pipes on “I Care,” which was transformed into an arena-rock ballad where she scatted along with the guitar solo, while Jay dropped a hopeful verse from the “4:44” bonus track “MaNyfaCedGod” into his tender performance of the 2002 track “Song Cry.” Beyoncé, perched on one of the stage’s two lengthy runways, followed it up with a ruefully show-stopping version of the self-explanatory 2006 ballad “Resentment” — after the line “I know she was attractive,” she pulled a face that elicited a roar from the stadium — that felt like the punctuation to a fight where the only winner was its ending. Jay followed with the “4:44” apologia “Family Feud,” and for the first time the stage lifted into the air, the two triumphing together. The pair reveled in that statement. Beyoncé threw back to the tank-and-cutoffs outfit she wore in the “Crazy in Love” video for that song’s performance, this time adding sequins’ sparkle to its joyous soul. 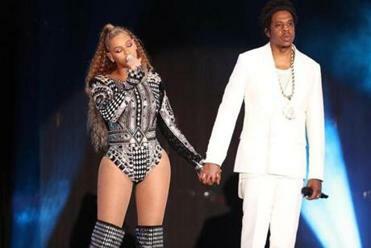 Videos of the couple enjoying family time with their children — and renewing their wedding vows — flickered while they performed a mash-up of Jay’s Alphaville flip “Young Forever” and Beyoncé’s verse on the Ed Sheeran chart-topper “Perfect.” Then they united on the “Everything Is Love” track “APE[expletive],” which pairs name-dropping of high-end brands like Philippe Patek and Lamborghini with intricate word games that take aim at institutions that have been slow to catch up with the times — the Grammys, even the NFL — and reveling in their own union. “I can’t believe we made it,” Beyoncé drawled on the chorus, as the two led the crowd in the sort of gleeful partying one might see from a particularly large and raucous wedding reception’s guests of honor, certain in their hope that they could weather nearly any storm.